The Coconut Grove Playhouse is an icon of Miami’s Land Boom Era and embodies an architectural style that became prevalent throughout the city. The famed Pittsburgh firm Kiehnel & Elliott designed the Spanish Baroque-style theater in 1926. 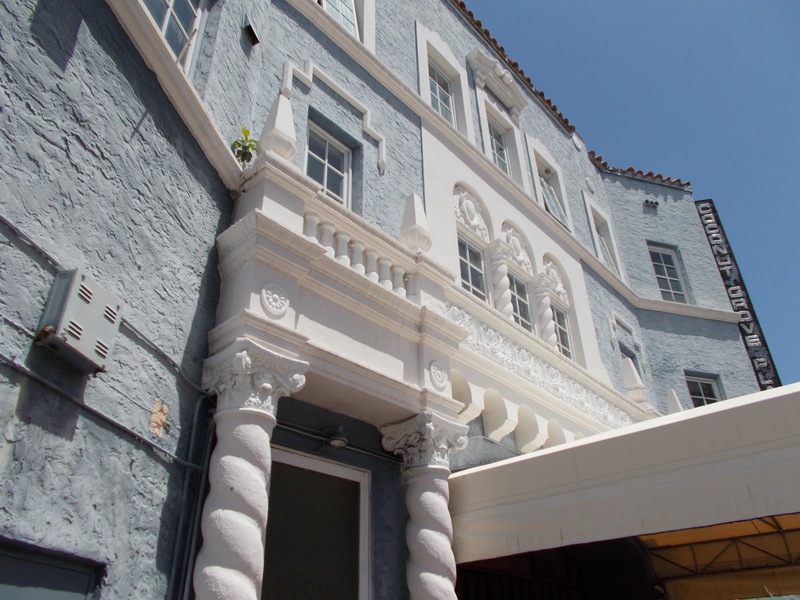 The firm, which opened offices in Miami in 1922, had previously designed El Jardin in Coconut Grove in 1918—a fine early example of Mediterranean Revival architecture in the city. 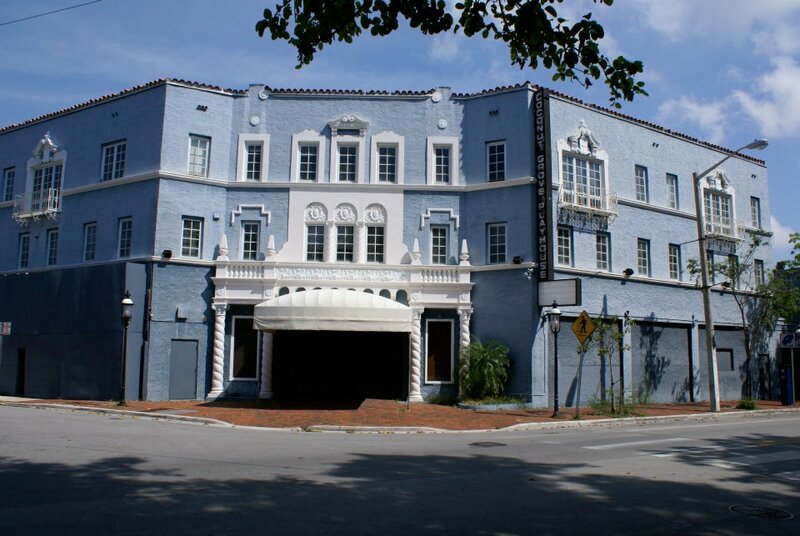 Before the Coconut Grove Theater was completed it was turned over to Paramount Enterprises, Inc. Mediterranean Revival and became their eleventh theater when it opened on January 1, 1927 with a showing of D.W. Griffith’s Sorrows of Satan. While the 1,500-seat theater was located on the ground level, the second and third floors were occupied by offices and residential living. But because of financial troubles in South Florida during the 1930s Depression, the theater closed its doors soon afterwards. In 1955 oil tycoon George Engle purchased the building for $200,000 and hired local architect Alfred Browning Parker to redesign the interior as a performing arts venue. The total cost was $700,000. 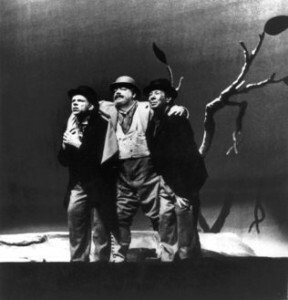 On January 3, 1956 the newly renovated Coconut Grove Playhouse opened with the U.S. premiere of Samuel Beckett’s absurdist play Waiting for Godot. Celebrities in attendance included playwright Tennessee Williams and actors Joseph Cotton and Joan Fontaine. Just two weeks later Tallulah Bankhead played Blanche DuBois in Williams’ revival of A Streetcar Named Desire at the Playhouse. Eventually poor ticket sales lead to the Playhouse shutting down in 1960. After years of different ownership, Arthur Cantor and Robert Fishko bought the building followed by a 1971-72 winter season. After 1977, the Playhouse was renamed the Players State Theater. The State of Florida purchased the Playhouse’s $1.5 million mortgage in 1980. The Playhouse would continue to run for many seasons but because of financial instability it was finally shut down in 2006. The partnership between Miami-Dade County and FIU will allow for a 50-year lease for the Playhouse with the possibility of two extended 25-year leases. FIU plans to use the Playhouse for various educational experiences including student internships, university-sponsored performances, community outreach and collaborative work with GableStage. The next step is to select an architectural and engineering team to renovate the abandoned, deteriorating building. For in-depth history on the Coconut Grove Playhouse refer to Carol Cohan’s Broadway by the Bay: Thirty Years at the Coconut Grove Playhouse (1987). This entry was posted on Thursday, January 30th, 2014 at 7:10 pm and is filed under Alfred Browning Parker, Architects, Coconut Grove, Kiehnel & Elliott, Mediterranean Revival, Neighborhoods, Preservation, Videos. You can follow any responses to this entry through the RSS 2.0 feed. Both comments and pings are currently closed.